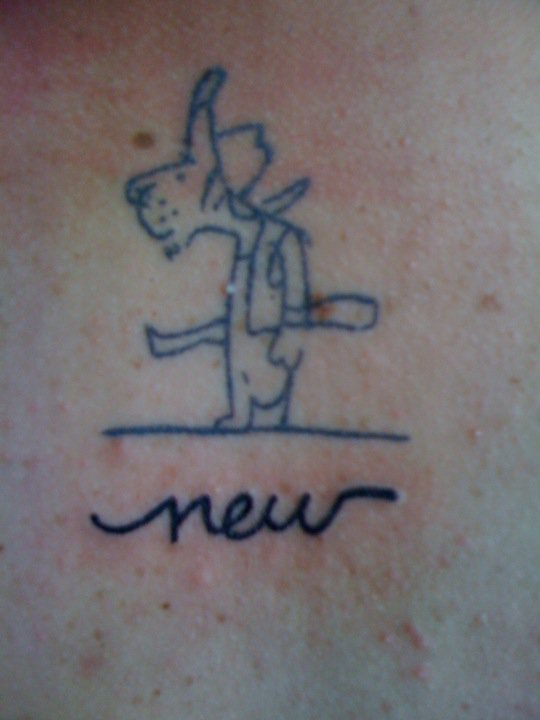 i was about 18 when i decided that i wanted a tattoo from lafcadio, my favorite shel silverstein book. as a kid i made my parents read lafcadio to me over and over. eventually i had it memorized and could “read” it myself. the tone and content of the book shaped me as a person. every school year it always the first book i read out loud to my class. i think that my tolerance for the unknown comes from this book. and a good chunk of my sense of humor. when i turned 36, i realized that 36 is double-18, and that half my life was long enough to wait for a tattoo. 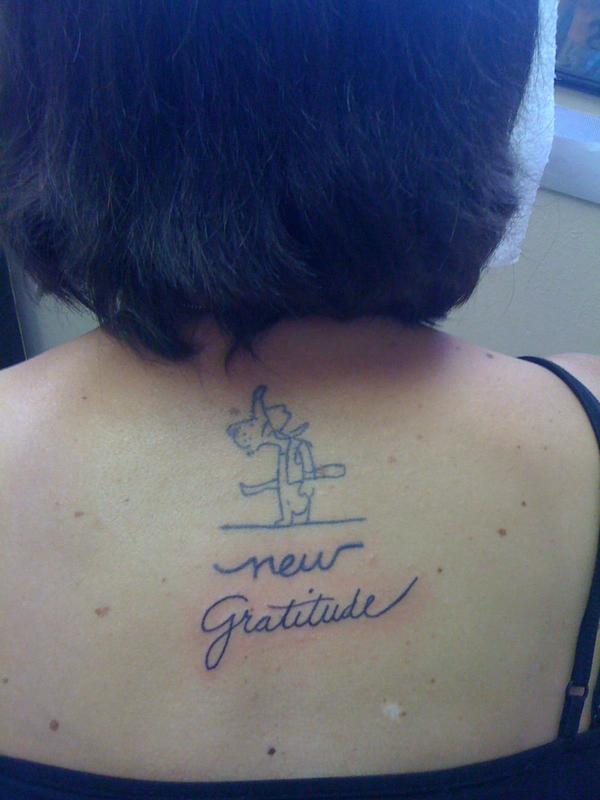 i still wanted the same drawing from the book in the same spot on my back – seemed like a safe bet. my grandma florence gave me some money for my birthday. i decided to use it to get my lafcadio tattoo. thanks for the rad tattoo, grandma florence! when i got back from my trip to the east bay, my mom greeted me with enthusiasm. and with a pile of information about tattoo parlors in corvallis. 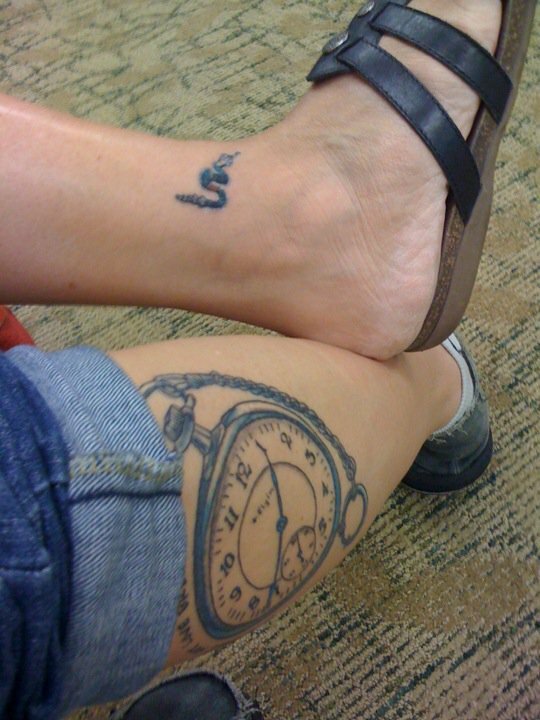 back when i was 18, she had responded to my desire to get a tattoo with an admission of her own desire to get one. she had a good story about what she wanted to get – her rattlesnake pendant on her ankle. 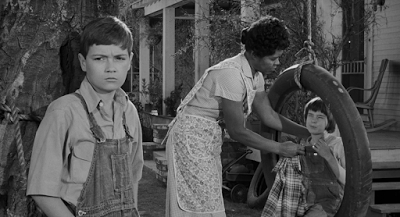 i wanted to get the pocket watch from to kill a mockingbird, and we made plans to get them together on her 59th birthday that coming september. but plans change. soon after, i was diagnosed with a brain tumor. my mom spent part of her 59th birthday visiting me in a nursing home. after my medical drama i started to feel a strong need to have a more visible scar. my surgery scars aren’t easy to see, and i wanted something like a badge to mark what i’d been through and survived. i decided that i needed to get a tattoo of a phoenix, because the symbolism was too good to pass up. i certainly felt like a phoenix, and i wanted to represent all of the folks who’d been a part of my surgery and recovery. it turned out that i was going to be in hawaii on the 1-year anniversary of my surgery. 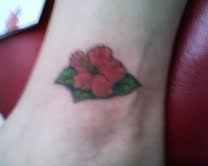 i found a tattoo parlor in lahaina and met with rob there. i explained it all to him and he drew up some sketches. 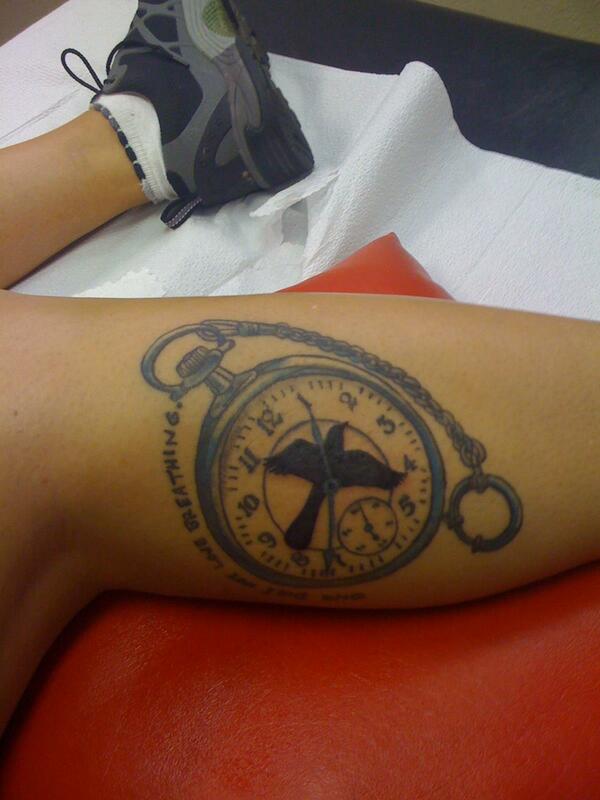 i wanted it to be round because i knew that i also wanted to get that pocket watch on my other calf and i wanted them to balance. 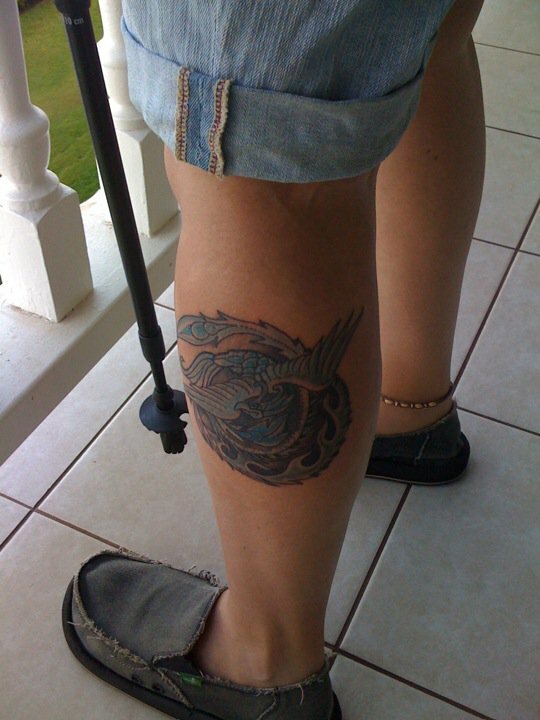 rob’s sketches were great, so i picked one and walked myself over to his shop (maui atomic tattoo) on august 7, 2010. i wanted it on my left leg because that’s the weak side from my stroke. that wasn’t the only tattoo i got that day. the other was inspired by my friend robyn. in a line down her calf she’s collecting small tattoos symbolizing important events in her life. i knew that i’d be collecting theme words and i wanted to do something special with them. robyn’s example gave me the idea to collect my theme words down my back. not wanting to miss the opportunity to customize things, i decided that i’d ask someone who was really involved in my theme word to write it for me and i’d get it tattooed on my back going down my spine. i asked emily to write “new” for me. she was a major part of my recovery and really helped me stay positive that first year. my mom and i made plans to get tattooed together the day before she turned 60. we went to high priestess in corvallis – a friend had much praise to denise there. mom went first, and she agreed with my assessment that it hurts enough so you know you’re getting a tattoo. this time i wondered what it would feel like – i was getting the pocket watch on my right calf, and as a complication from the surgeries i have no temperature sensation on that side. the answer was that i could feel the needle vibrating but i didn’t feel any pain. since it didn’t hurt, denise zipped through my tattoo in record time. 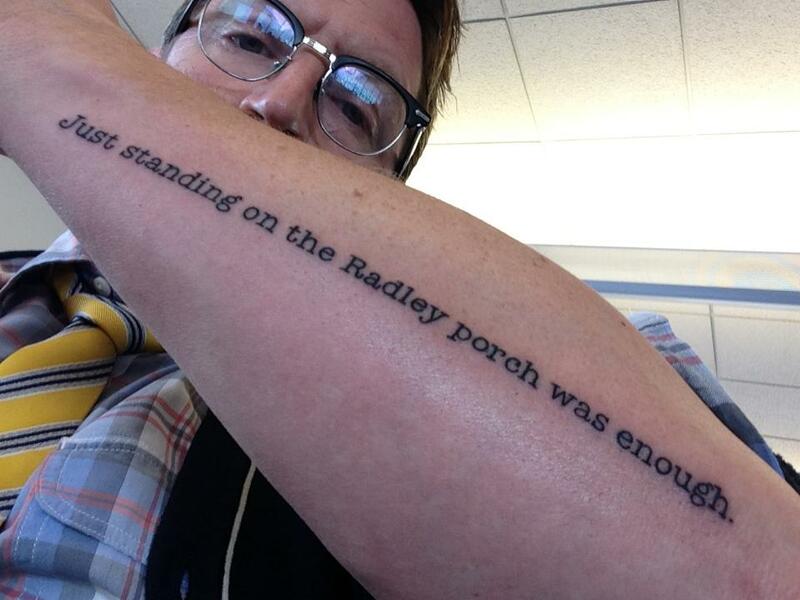 i knew that i wanted to include a quote from to kill a mockingbird as part of my tattoo. when i was in the hospital, my mom read it to me and i had her mark lines that really spoke to me, so that i could choose one for my tattoo. the one that stood out the most was “one does not love breathing.” that part – when scout is afraid that she won’t be allowed to read with her dad anymore because her teacher doesn’t like that she already knows how to read – has always meant a lot to me. but that phrase has new meaning, because now i really do love breathing. i asked my dad to write it out for me – he’s always had really distinctive printing – and he reluctantly agreed. i had denise point the hands at the 7 and the 1 – my parents’ wedding anniversary is july 1st. 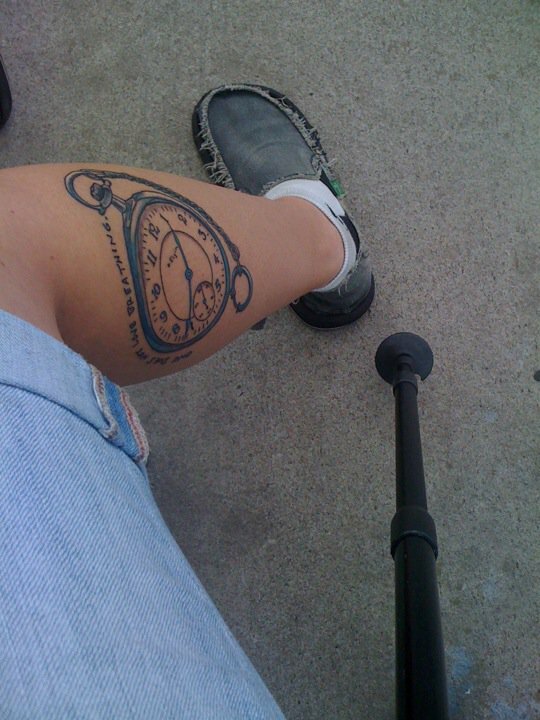 i love my pocket watch tattoo. i like it when people stop me and say, “can i read your tattoo?” but after spending some time with it, i decided that there was too much open space in the middle of it. my solution was to get denise to add the mockingbird from the cover of the paperback edition. so on the 2-year anniversary denise did just that. august 7, 2011 was a busy day for tattoos in my family. my mom got a hibiscus on her other ankle – this had been her plan to represent the two sides of her personality with balanced tattoos. i also got my word for year two – gratitude. i asked my friend vickie to write it – she’s been in my life for a decade now and has a lot to do with that word. a bonus is that she has lovely cursive. i’ll crunch some numbers. i’ve been tattooed in 3 states and have 7 words tattooed on me in 3 people’s writing. 2 book tattoos. 2 bird tattoos. 1 gun tattoo. 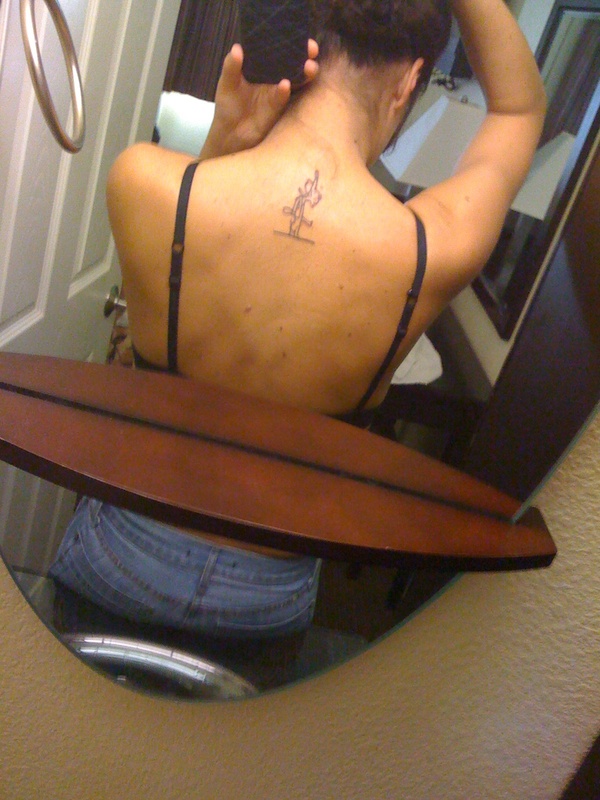 in 2011 i’ll add another tattoo to my collection – “experience” – and the jury’s still out on who will write it. i don’t know how long i’ll collect theme words on my back. i think i’ll know when i’m finished. i really love my tattoos. i feel like there are good stories about each of them – where i got them, who i was with, what they represent, their location on my body. now i find myself drawn to people who have tattoos. i want to hear the stories behind them.